Limited edition, 12-inch scale statue of Matt Murdock. Straight from the fight scene in Season 2 of Marvel's Daredevil. Designed by Caesar and sculpted by Rocco Tartamella! 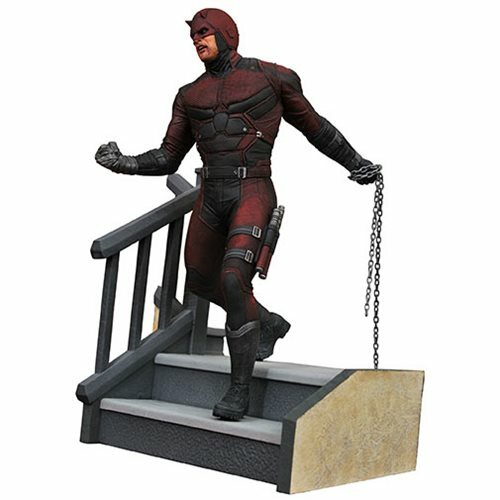 Straight from the infamous fight scene in Marvel's Daredevil Season 2 on Netflix, this superb 12-inch scale statue shows a battered Daredevil descending a staircase with duct tape on one hand and a chain in the other. The Marvel Premiere Netflix Daredevil Statue is a limited edition of 3,000 pieces that comes with a certificate of authenticity in a full-color box. It's designed by Caesar and sculpted by Rocco Tartamella!